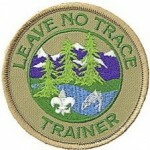 Come and spend the weekend in our outdoor classroom learning to apply and teach the Leave No Trace principles! Various teaching methods will be utilized throughout the training so you can gain confidence in planning workshops to share LNT in a variety of settings. Because this is a training to prepare you to teach others, you will be given a LNT principle to teach the group in a 10-15 minute lesson. Upon completion, you will be registered as a trainer with the Leave No Trace Center for Outdoor Ethics and will receive a certificate of completion and a trainer pin. Course limited to first 10 participants! BSA medical form 34412 required.